Its "best" mode has lost a lot of its charm, but NBA 2K17 is still a beast of a game. At this point in the NBA 2K’s series’ long ride at the top of the genre, you have to wonder just how tough it is for developer Visual Concepts to find new ways to improve the perfected. Even where NBA 2K games have gone wrong (like last year’s Spike Lee snorefest), there’s a nice balance alongside consistently tight gameplay fundamentals. These are games that are becoming increasingly difficult to fault, and even when you do find something that frustrates, there’s almost immediate restitution. 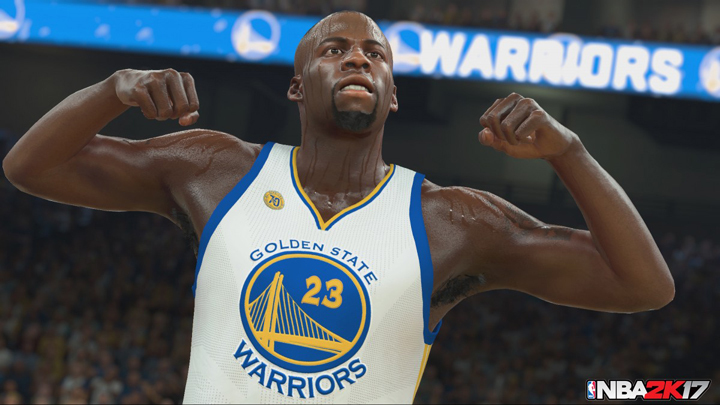 NBA 2K17 maintains that identity, at least on the gameplay front. When you hit the court, it’s as spectacular as it’s always been. There are some genuinely great improvements all round. However, while this year’s entry keeps the franchise firmly embedded as probably the best sports game on the market, it’s held back by intrusive microtransations, and probably the worst MyCareer mode in the franchise’s storied history. It’s the most popular mode in NBA 2K, the franchise’s trailblazing rags-to-riches sports RPG, in which you create a player, choose their position and slowly build their skillset. As you climb the ranks towards NBA stardom, you’ll play a handful of college games, make friends, sign sponsorship deals and grind your way through attributes to improve your player’s game. MyCareer arguably peaked with NBA 2K14, the series’ first appearance on this generation’s round of consoles. Since then, however, it’s lost some of its rewarding sense of engagement and progression. Subtlety, developer Visual Concepts has tightened the ways in which you can improve your player’s skills, lengthening the grind and tempting you with Virtual Currency (VC), which you use to buy player upgrades and the like. As recently as two years ago, you could create your player and be an NBA superstar within 15-20 hours. You wouldn’t need to spend a cent, and the game actively rewarded you for that. Fast forward to NBA 2K17, and it’s almost impossible to ignore the temptation of a quick VC boost. That’s because the grind is mindless. You’ll start by choosing a college, although this is merely an aesthetic touch and doesn’t have any affect on your future. Regardless of how you play during these matches (you don’t get a teammate grade), you’ll get berated and ridiculed on social media for being terrible. You’ll start as a mid-range NBA draft pick, although it’s far easier to drop down the pecking order than it is to climb up it. As you can see, NBA 2K17 punishes you from the onset by making you think you need more help than you actually do. MyCareer has always been fairly punishing, but with a genuine interest in helping you improve. This year’s game doesn’t care if you get better: it just wants you to spend money. It gets you to do this by forcing pointless cutscenes, irrelevant phone conversations, and team practice sessions, none of which can be skipped (except team practice, although skip that and you’ll lose minutes, so don’t skip it). It’s so obviously a forced grind to the point where the game wants you to give up and spend some cash, because your player starts off so shockingly bad that it makes the first few hours of the mode almost unplayable without some sort of attribute boost. It sometimes plays like torture. Michael B. Jordan’s Justice Young character is a shining light, and it’s nice to be able to share the “journey” with another player. But the game never really seems to combine off-court shenanigans with on-court progress. I can’t help but wonder what the whole point of it is. Is it an improvement on last year’s Spike Lee joint? Maybe. Last year’s mode was too intrusive, and made it less about “your” journey and more about the story in Lee’s own universe. This year it all just seems “there”, and it’s terribly hard to give a hoot about it all. It’s just background noise. Let me play, train, upgrade and improve. Some nice backstory, sponsorship deals and all that are nice, but a two-minute cutscene of my player sharing a phone conversation with his mum? For real? It’s punishing for not buying VC. Of course it doesn’t stop once you boost your player’s skills up, but it’s easier to deal with it all knowing you’re landing A+ grades every game and leading the league in points and assists. MyCareer needs to go back to doing what it’s always done best: building the PLAYER. I understand that in reality, off-court relationships and finances form an important part of a professional athlete’s life, but I just don’t think it works here. Playing in the NBA is so far removed from reality for a vast majority of us, and as such this mode should be a fantasy, not an obligatory phone call with your mother. I want to learn more about my teammates, attend press conferences, have a say in team meetings, and be the face of my team. Those things still exist in the mode, but they take a backseat to a story and grind that have led to the mode losing a lot of its charm. If it does one thing right, however, it’s refine the ways in which games actually play out. I’ve written an extensive guide for MyCareer, and I do feel that if you’re committed to the grind, as tough as it may be, the core basketball experience is better that in past years. Players seem more aggressive defensively, and are more likely to pass to ball handlers and acknowledge moments of genuine urgency (like fast breaks). Play calling still needs some work, and this stretches out into all other modes in the game. Calling the “Smart Play” is a nice way to cycle through your teammates on offense, but often they just crash and bash into one another, making it tough to finish a play before the shot clock winds down. This is balanced out, however, by improved AI defense. Stealing is “easier” so long as you exploit poor ball handlers and players that don’t protect the ball. If you force the dribble or overuse dribbling maneuvers, the AI will steal the ball. Improvements to shooting I feel make the entire experience not only more accessible, but also more diverse for seasoned players. The shot bar that hovers around a player forces you to familiarise the nuances of each player’s shooting abilities and hotspots. Some long-range shooters are great at the top of the key yet terrible along the baseline. Some front-court players have nice range, but require a little more finesse around the basket. The shot stick provides a nice boost to accuracy…but it’s not easy to master. There are ultimately two ways to play NBA 2K17: the easy way or the hard way, and both make for an impressively deep, varied and rewarding on-court experience. There’s also an improved sense of space and pace. The game wants you to take advantage of space and drive the key, but what this forces is erratic defense changes, more fouls, more injuries, and players fatiguing faster. There are more steals, so more fast breaks. Momentum still feels to play an important part, and finding that sweet spot with shooters and on the defensive end can quickly see a 20-point deficit turn in your favour. Hearing the commentary team — which is probably the best in the genre — get up out of their seat during a close game and after big shots just adds to an atmospheric sense of realism that can make NBA 2K17 rather special. It’s what makes me dislike MyCareer even more. The whole mode seems so at odds with the broader NBA 2K17 experience, which is refined and tweaked to improve upon the perfected. There is a reason why this series is at the top of its game: it gets basketball. MyCareer, however, is the exception: I’d much rather stick to MyGM or MyTeam. The latter is still heavily reliant on microtransations, but at least you’re playing with experienced NBA players that make the matches somewhat bearable: so long as you play to your team’s strengths and defend well, you can beat the in-mode challenges, build up your currency, buy more cards and create a beast of a team. It’s a grind, sure, but at least you’re not guiding a single player with a 59 rating for 5 hours. This is ultimately where NBA 2K17 saves itself. Where it falls down with MyCareer, it picks itself up and dusts itself off with a host of other fantastic modes. MyLeague and MyGM are exactly the kind of modes that diehard fans have been crying out for. League and team management, expansion, trading, salaries, staff management. The depth on offer here is crazy. Team creation is a fantastic addition that might be worth purchasing the game for alone. I won’t be surprised if these two modes eventually overtake MyCareer as the most popular in the game, especially if 2K Sports continues dragging the mode down the pay-to-win path. NBA 2K17 was reviewed on Xbox One using a promotional copy provided by 2K Games.